It’s a great feeling when the work and commitment to your community is recognized and celebrated! Just like it was at the 103rd Annual Meeting for the Sycamore Chamber of Commerce, held on Thursday, January 31, 2019. 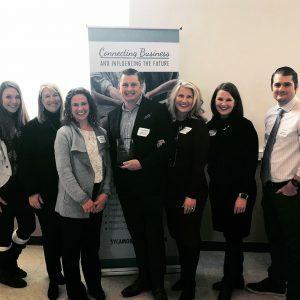 The MorningStar team was awarded with the 2018 Chamber Champion Award, which recognizes a Chamber Member Business that has an outstanding relationship with the Chamber and contributes significantly to the community as a whole. For more than 37 years, wehave helped drive growth and profit with our client partners, using a powerful combination of marketing tools. Each year, we are proud to donate more than 500 hours of work toward non-profits, in addition to building long lasting community and business relationships in and around Sycamore. We’re a dedicated partner to many non-profits in our community such as: United Way, YMCA, Sycamore Library, 4-C, Hope Haven, Safe Passage, Opportunity House, VAC, Kishwaukee Special Recreation Association, United Leukodystrophy Foundation, DeKalb County Community Foundation, Pay It Forward House, and many more. We couldn’t be prouder of the community that we have called home since we opened our doors more than 37 years ago, and it’s our pleasure to be able to support so many organizations, non-profits and businesses that are right here in our town.